Rant incoming, here is some background: Three of the four cars my wife and I own stay at our apartment. 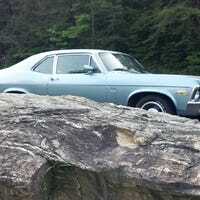 The fourth (the Nova) stays at my grandparent’s place, which is close to an hour away. I’m just a bit surprised; usually something like this happens and people freak out like the world is ending. I haven’t seen it reposted anywhere. Bad News, Good News, and Help Me Decide! Did the previous owner called it a Cowboy Cadillac? Does it drive like a couch?